We’re finally here! Day twenty! And our last recipe is another inspired by recipe, if you didn’t know already, we LOVE Gilmore Girls, and a couple months ago we decided to make some ice cream flavors inspired by our favorite show, so while the official title of this ice cream is Milk and Cereal Ice Cream, we like to call this ice cream, the Logan Huntzberger Special. On one of their dates, Logan and Rory break into the Yale cafeteria for ice cream and Rory notices the cereal section completely full. Now in the episode, Rory is excited about Cocoa Puff, but there was just something about Fruity Pebbles that screamed Gilmore Girls, so here we are. Our last day of twenty days of 4/20 and mixing it with one of our favorite shows. Hopefully you will not only enjoy this recipe but the 19 other we’ve already posted! Cereal Treats. Who doesn’t love cereal treats? They’re sweet, crunchy and keep your mouth busy and filled with flavor. Now, while we love the OG Rice Krispie treats, we thought we would give you something extra special. 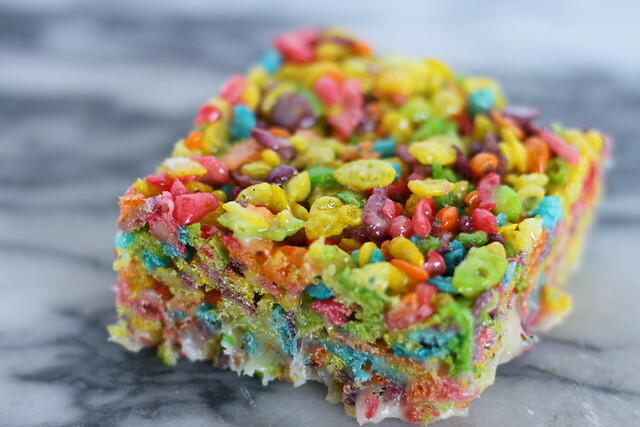 Fruity Pebble Treats. 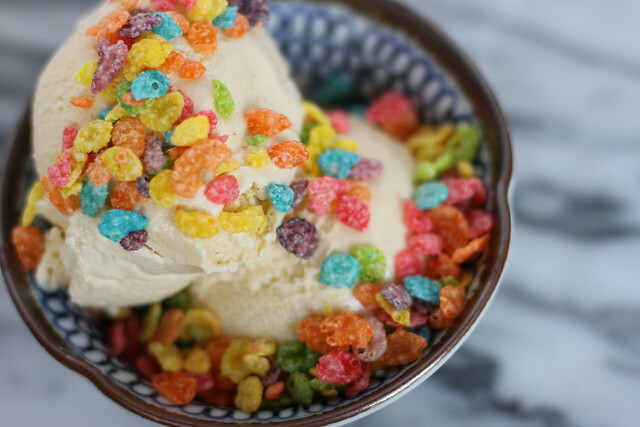 You could honestly try this your favorite cereal, but fruit pebbles are definitely high on our list of favorites. Seriously, these were one of our favorite recipes we made for this. Something about the marshmallows sinking to the bottom, the crunchiness of the cereal, the overall mouth feel, was truly wonderful.